If you're an avid photographer, you may find yourself looking for ideas for craft projects using pictures. After all, what's the fun of getting the perfect shot if you can't enjoy your image on a daily basis? 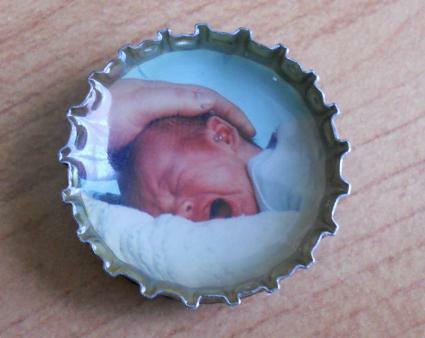 Bottle cap magnets are easy to make and provide a unique way to display your favorite pictures. They are also wonderful inexpensive gifts for friends and family members. Use your scrapbook punch to crop your print into a circle. Experiment with various compositions to see what looks best. Attach the photo to the inside of the bottle cap with double sided tape. Push down to make sure the tape is firmly adhered. Fill the inside of the bottle cap with Ranger Glossy Accents. Do not shake the bottle, as this will create air bubbles in your gloss medium. Let the bottle cap dry completely. In most cases, you'll need to wait overnight for the cap to be completely dry. When it is dry, you'll have a hard and clear coating over your photo instead of a cloudy finish. Use E-6000 glue to attach small magnets to the backs of the finished bottle caps. If you're going to give a set of magnets as a gift, decorate your candy tin with patterned scrapbook paper. Adhere the paper with double sided tape. Attach thumbtacks to the back of the bottle caps to make pins for a bulletin board. Glue a row of bottle caps to the front of a decoupaged cardboard box to make a unique storage container for magazines or other small items. Design a greeting card that uses a bottle cap as the main embellishment. Use them as accents on a scrapbook page. Attach a jewelry bail to the back of the bottle cap with E-6000 and turn it into a pendant for a photo necklace. A decorated photo CD is another example of thrifty craft projects using pictures. The finished CD ornament can be added to your Christmas tree or simply hung up to enjoy as wall art throughout the year. Cover one side of your CD with double sided tape. Press the taped side down onto the back of your decorative paper. Use a craft knife to trim the paper to fit the CD. If you have rough edges after trimming the paper, gently sand them down. Add a bit of brown craft ink to the edges for a vintage look, if desired. Repeat steps 1-3 to cover the other side of your CD. Add photos to your CD. Apply stickers, rub-ons, or other embellishments as desired. Use your hot glue gun to attach a ribbon hanger to the back of the CD. Photo globe: Frame your photos with a paper craft photo globe. Photo soap: Embed a photo in a bar of glycerin soap. Set of colored pencils: Design a set of colored pencils that fit together to showcase one special photo. Origami picture frame: Fold origami picture frames for your favorite snapshots.